We are not fast food. We make every pizza to order. The crew is instructed to make every pie to the same high quality standard even if they're rushing. The cashier should be able to give you an idea of the wait time. It takes a few minutes to sauce, cheese, and top each pizza and then it takes approximately 10 minutes for it to bake. It's not done yet since we need to let it cool for a minute or two before slicing. Then we can finally slide it onto a pan or into a box for you to enjoy. If you're pressed for time, consider calling in your order and we can have it ready for pickup at your chosen hour. We also have an 8" personal pizza for smaller appetites. It's made to order fresh for you for just 6.50. Due to its small size, we have to limit it to 3 toppings tops! Just like our candy-making operation, you can watch your pizza being assembled through the window. You can also see the hulk of a deck oven that we have. If you find Patrick out on the porch, you can get the whole story, but essentially he bought it from a baker who had it out in a field. Asking price $25, purchase price $35. Somehow they got it back to the shop and, after rounding up all the family engineers, they also somehow got it stuffed into the front kitchen where it now sits. The oven is a 1916 Edison Electric with approximately 2000 pounds of bricks inside. Keith has redone all the controls so it has state of the art digital temperature control and he even fixed a bunch of elements on the inside. It's an amazing piece of equipment that keeps on going with just a bit of regular maintenance and occasional repair. He's even managed to move it to be able to install the new floor underneath. This is one pretty pie, but beauty is not just crust-deep, it tastes great all the way through! 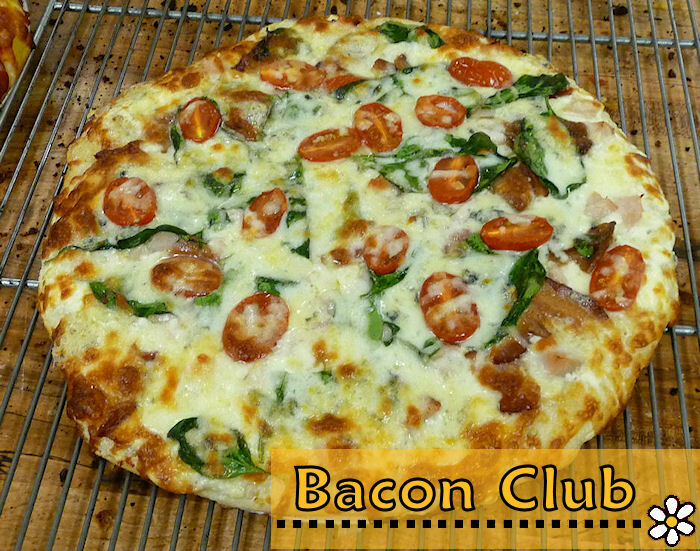 The Bacon Club Pizza is white garlic sauce, turkey, applewood-smoked bacon, gorgonzola, spinach, and halved grape tomatoes. 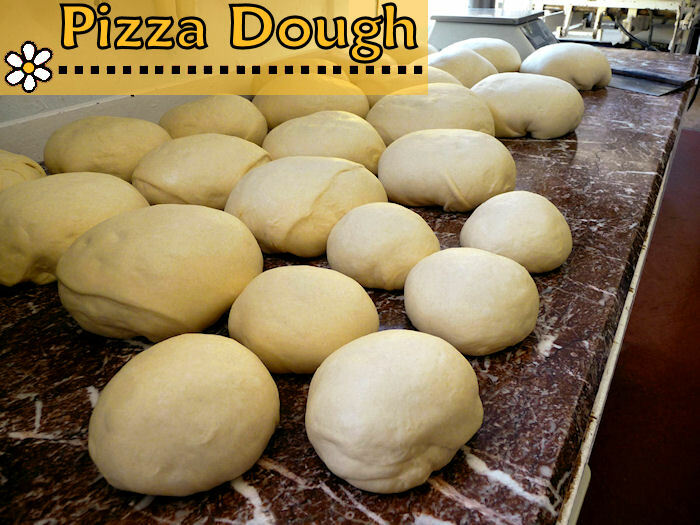 All our pizza dough is made from scratch. We make our own sauces and grate our own three cheese blend. We also have a parmesan blend available for sprinkling, but it's not out on the table. We keep it refrigerated since we grate it ourselves from real Italian Parmigiano-Reggiano and Wisconsin Parmesan and Asiago cheeses. Occasionally we forget, so if the parmesan and pepper flake shakers weren't brought out to your table, just let us know. We'll be happy to get them for you! For a small surcharge, we have a gluten-free crust that we purchase from 5b's Bakery in Concrete. We keep a separate sauce batch and utensils for gluten-free pies and all our toppings are naturally gluten-free. 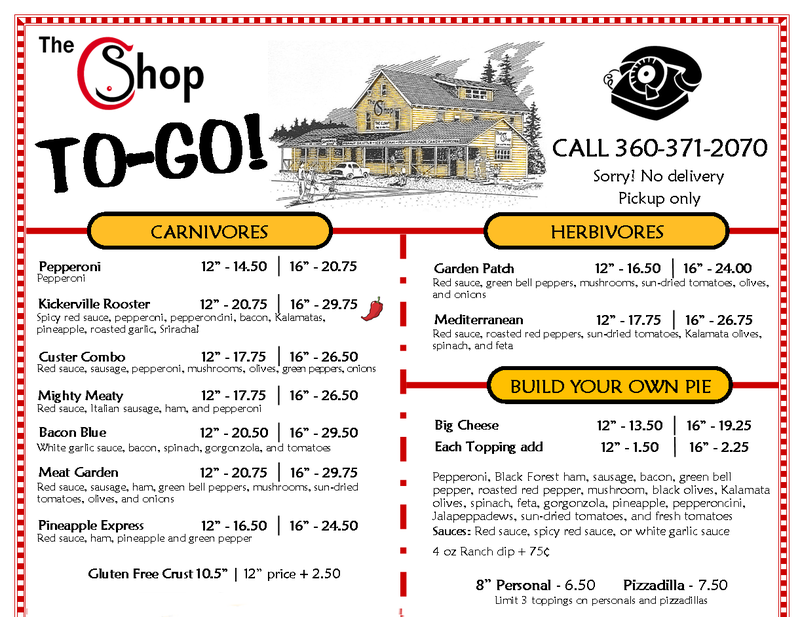 Just let us know when ordering and we'll do our best to accommodate you.